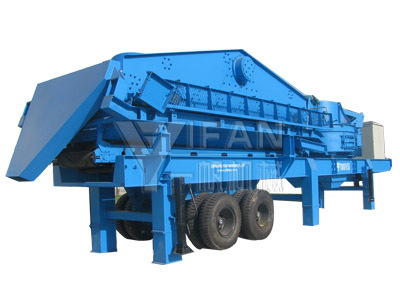 YIFAN’s PP series Mobile Screening Plant is material screening stations. Every screening station is an independent working unit, which can respectively assume their different responsibility, and can be combined to satisfy various screening needs. Working Principle :The appropriate material is fed into the vibrating screen by the belt conveyor, which falls into belt conveyor again through the chute after screening. Then the return material is transported into the production line to processing again and the qualified material is transported to designated locations by belt conveyor. Outstanding Advantages: The plant has the advantage of reasonable matching, unobstructed discharge all line, reliable working, convenient operation and energy efficient. Especially the mobility is very good, so it can extend with the raw material places or the construction sites, and it can also make multiple matching to satisfy different product requirements. Application: The whole set plant is widely used in mine, building material, highway, railway and hydropower industries, etc.to finish screening operations at one time, which could produce output of required capacity and particle sizes for consumers.